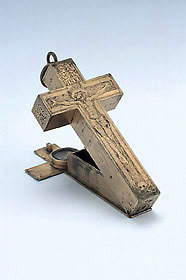 In this example of a crucifix sundial (a special case of a polyhedral dial where the shape has been chosen to have devotional significance) the front surface of the cross has an engraved image of Christ at Calvary, which is usual. The back has the less common image of the brazen serpent which Moses was told to present to the Israelites dying from snake bites in the desert. This is often understood today as a symbol of the physician, since the Israelites were healed by looking at the serpent, but it was probably included on the dial to make a theological point: the Christian is healed spiritually by looking in faith at the sacrifice of Christ on the cross.